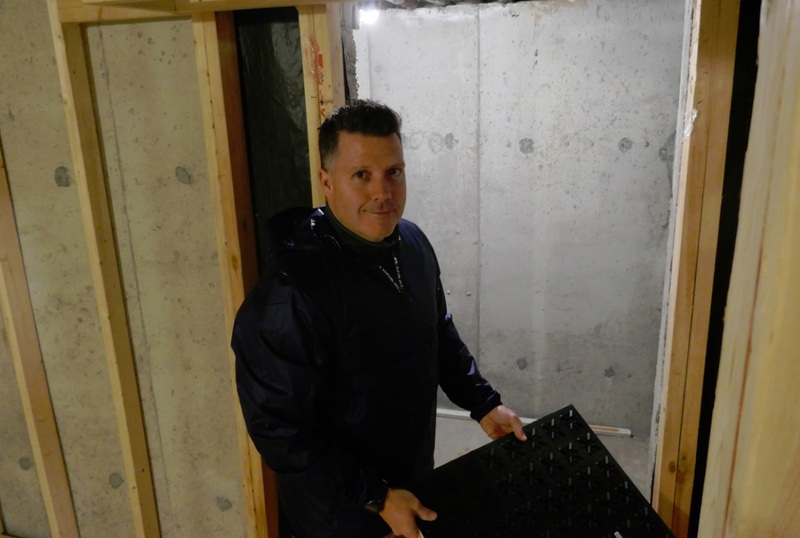 The homeowner’s blueprint for basement renovation has a ‘cold cellar’ landmine. During a recent Mississauga basement renovation, Eastview Homes worked with Rosehill Wine Cellars custom design team to complete a section of the blueprints where their designer had initially written the words ‘cold cellar’. Now that is exactly the type of floor plan landmine that needs discussing in advance, as there are many interpretations of what exactly constitutes a cold cellar. 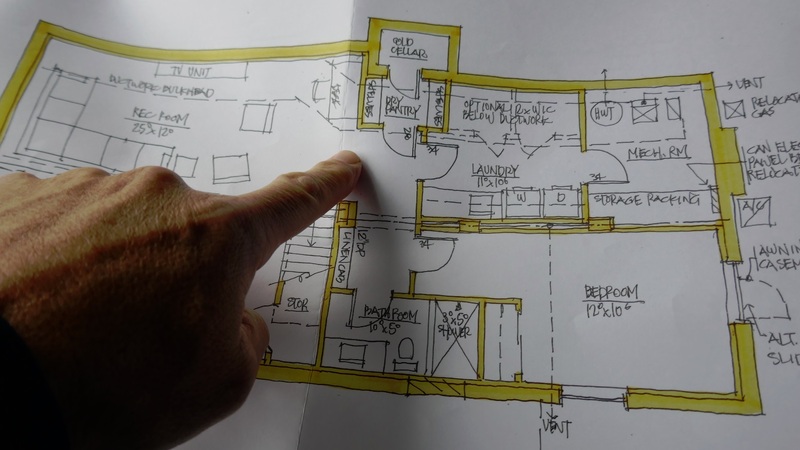 Designers often put words like that on floor plans with no explanation, but a good builder will always ask for details right away, and if none are provided they would simply leave the room unfinished. And sure enough, after a brief conversation with the homeowner, he revealed that it was his ultimate desire to have a wine cellar in that space. Well these are two very different things. A cold cellar is for fruit preserves and has potato bins and shelves for sealer jars; such rooms often have no additional insulation or cooling apparatus. A wine cellar is different animal altogether. Eastview Homes has lots of experience doing upscale basement renovations, and we’ve made rooms that afterwards became wine cellars, but we have not, up to this point ever installed the actual wine racking or cellar cooling systems. And those are just two of the many elements necessary for proper wine storage. So to give our client the very best cellar space possible, we called upon the experts at Rosehill Wine Cellars, sending them copies of these plans and a more detailed close-up schematic so we could get their premier cru 6ft custom wooden wine racks made exactly to the right size to perfectly fit the space, which as you can see in photos below still needs insulation, a proper sub floor and a ceiling with lights. This new Mississauga subdivision with its beautiful big houses still has small trees out on the front lawns, and one of Ontario’s best public schools at the end of the street. Its a lovely little world up here where these new families all know each other, and their kids ride to the corner store together where they leave their bicycles unlocked and propped up on kickstands out front on the sidewalk. In the summer time, these neighbors all enjoy each others’ company in BBQs and they swim in each others’ backyard pools. In other seasons these parents go on Power Walks, share books and movies and have dinner parties. And that brings us to the wine club. Fine wine is fun to collect again in the dot com era. There are so many Wine Lover websites now with members trading bottles for upscale dinner parties. Many sites provide auction venues for collectors buying and selling bottles and bragging rights. Its not good enough anymore to have people over to dinner and serve them something you just picked up in the LCBO yesterday. Wines are windows into summers past. To accompany a meal with good friends, an oenophile must select something that’s at least five years old, and from some exotic part of the world; these neighbours double down on delicious foods that are rare and steeped with stories. Five year old wine is hard to find unless you’re part of a wine club, or you have your own collection in your own basement wine cellar. Because the manner in which wine is stored and handled impacts the way it tastes when served, wine cellars are a very big deal; they need much more attention than a normal cellar storage space, and even more than a cold cellar. Wine collectors have no control over how their wine was made, and they really don’t know what it is going to taste like until they try their first glass from a particular vintage. But all wine collectors realize their immense responsibility after purchasing the bottles; it’s up to them to treat these dark glass containers properly and in ways that will increase their wine’s flavour and their investment’s value. Wine stored in garages and attics is quite often subject to excessive temperature fluctuations as the weather shifts from season to season. To avoid that situation, our basement wine cellar needs insulation. Cellar owners must minimize the potential ‘coolness’ loss in windows and poorly insulated doors and ceilings. Top cellar owners concentrate on building a controlled environment for their prized wine collection. Let’s start with the wine cellar door. The entrance to the wine cellar is very important. This basement wine cellar space will need an exterior quality door and yet, one that is still aesthetically pleasing and seems like its part of the indoor decor. It can be a challenge to find the perfect door that looks right, and is also functionally and technically sound. Improper doors leak cool air which is bad for home heating, and bad for the wine collection as the air leak warms up the bottles. That is a lose – lose scenario that must be avoided. According to Rosehill, wine can be stored safely from 40° to 65°F (4° to 18°C). The optimal storage temperature depends on the wine’s age and how long it will be stored. If the bottle will be opened within a year or two, a warmer temperature of 60-65°F (15° to 18°C) will speed the development of the wine’s bouquet. Maintaining the optimal temperature and avoiding temperature swings in the cellar are the two most critical exercises for proper wine storage. A stable and pervasive chill is what makes a good wine cellar, and so the wine cellar door should close with a crisp ‘thump’ that indicates a firm air-tight seal has been made between the two spaces. The area of the basement that the homeowner selected for the wine cellar is very small, about 100 square feet. This will make it easy to refrigerate, but what about the humidity? Relative Humidity (RH) is the percentage of vapor in the air at a given temperature. Storage humidity levels should ideally stay between 50-70%, not much higher, nor lower. When it is too high, mold can form and your labels will be ruined (excessive humidity does not affect the wine, however). TIP: Wine bottles should always be stored on their side to allow the wine to keep the cork wet, and this contact will discourage the cork from drying out should humidity conditions not be ideal. Proper ventilation is critical for long-term wine storage as it allows for sufficient air-flow to help eliminate odor build-up, or mold, which can harm wine bottle corks and labels (*although some winemakers like moldy cellars as they believe the earthy storage environment can positively impact the wine). But more importantly, moldy cellar ruin houses. During the wine cellar design phase, and wine cellar construction it is important to include an adequate method of ventilation and air-flow. In this case we knew the wine cellar cooling unit would be located beside the water tank and furnace and the ventilation would be conducted into the space from this central area, but we left it up to the experts at Rosehill Wine Cellars to build and install this important component. How to Light the Wine Cellar? 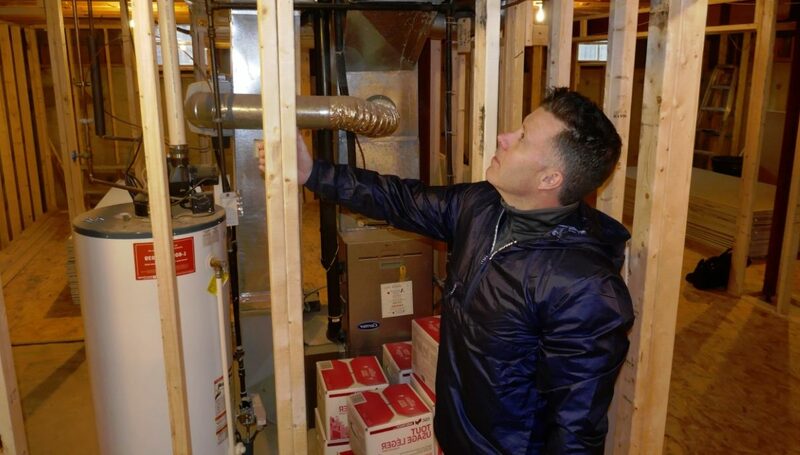 The area of the basement the homeowner selected has no windows that need to be worried about in terms of heat loss or light penetration. Rosehill blogs point out that ultraviolet light can cause oxidization of the tannins, causing an unpleasant aroma, ruining the wine. Their wisdom reports that sparkling wines are even more sensitive to light (all spectrum) and should be given extra care when stored in wine cellars with lots of foot traffic and fingers on the light switches. Light switch timers are recommended in places where people may and probably will forget to switch off the lights. Its important because delicate, light-bodied white wines are at risk from light exposure, and thus they are often packaged in darkly tinted wine bottles that offer some protection from bright light. It isnt’t enough though and they need to be stored in dark places. Wines packaged in clear, light green and blue colored bottles are the most vulnerable to light and may need extra precautions for storage. For lighting in this wine cellar, we have selected LED pot lights with very well insulated pots. LED lights come in a variety of shapes and configurations and can be made to look incredible in any space. While tungsten filament pot lights on a dimmer switch may seem like a good decorative idea, and one that is imminently functional, the pots are seldom insulated well enough to avoid head loss. LED lights are a different story and above all else you should never have fluorescent lights in your wine cellar. Fluorescent lighting emits significant amounts of ultraviolet light which negatively impact wines on a photo-chemical level. UV light can age wine prematurely. Sunlight, fluorescent lights, and even some tungsten filament incandescent lighting can adversely react with phenolic compounds in wine and create “wine faults”. A wine fault is an unpleasant characteristic of a wine often resulting from poor wine making practices or storage conditions that leads to wine spoilage. Many of the elements that cause wine faults are already naturally present in wine, but at insufficient concentrations to be of issue in most bottles. Wine Cellar Racking: What’s the Best Angle for Wine Cellar Bottle Racks? Wine cellars need wooden wine racks and so we had some work to do figuring out the dimensions in accordance with the necessary insulation and vapour barrier. Wine racks are important because wine is always stored on its side so the corks remain wet, and in this state the transmission of air through the cork into the wine is minimized. When bottles are stored upright, the cork eventually dries out and oxygen in the air causes chemical changes in the wine, spoiling it. Additionally, when wine bottle are stored upright in adverse conditions some corks may work loose due to pressure changes and this can cause leakage or oxidation. So wine cellars always have wooden racks that lay bottles horizontal. And if you notice these racks are almost always made of wood because that minimizes the effects of micro vibrations which can also ruin wine over long periods of time. Constant vibrations in your wine cellar will disturb the slow process of biochemical evolution in wine and this is often fatal to “finer crus”. Our client has selected the All Heart California redwood wine racking in a custom cellar to be built by Rosehill Wine Cellars – stay tuned for updates on the Eastview Homes blog to see the finished project. Rosehill Wine Cellars shares a lot of their ideas about proper wine cellar temperature, humidity, lighting, racking angles, and how to manage vibrations and ventilate your wine cellar on their Wine Storage Blog. Wine aficionados can visit that site and droll over the picture of their many wall mounted wooden wine racks, wine coolers, temperature & humidity controls, storage angles and crystal wine decanters; all the components and accessories necessary in a world class wine cellar are on display on their website. In summary remember, the wine cellar manager is a guardian of flavour. He or she cannot control Nature, the geography in which they live or its climate. Nor do they have any control over the amount of rain that falls, or sun that shines. All they can really manage is the quality of their wine cellar, and especially its construction, and its day-to-day operation as they struggle to stay cool in all seasons.